For my Thomas Burnett Memorial Scholarship, I decided to do an art project to express Mr. Burnett's display of Bloomington's Core Ethical Values on the tragic day of September 11, 2011. I cut out the word "STRENGTH" on the thick poster board and made a collage of something related to Thomas Burnett inside each letter. I made the collage out of ripped up magazines and placed them to create a picture. The beginning S and ending H are done as the American flag. I did this because Thomas Burnett put his country first and was more than an exceptional U.S. citizen. S standing for Strength and H standing for Hero, which he displayed both. Inside the T is a football and in the R it says some of the schools he attended. Both of these letters show his responsibility and drive he had in the academic part of his life. The E has a bald eagle sitting on a tree limb. The eagle is a symbol for the citizenship he displayed in his everyday life. Mr. Burnett loved politics and admired the hard work of previous American Presidents. Inside the N there are people holding hands with a heart above them. This represents Tom's love for his family and his respect towards everybody around him. The G pictures a person fishing, which was one of Tom's past times. The second T has a cross inside standing for his faith, not just in God, but his faith showed every day. 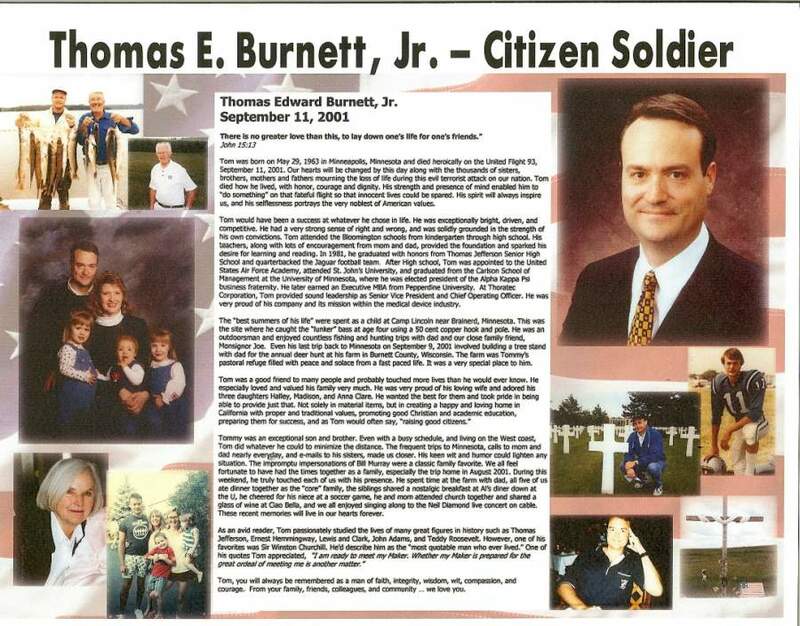 Throughout the process of making this project I have gained the knowledge of what Thomas Burnett actually did and how much of an impact he made to our country. Also, that he was a one of a kind U.S. citizen and he truly embraced all Bloomington's Core Ethical Values, not just when he was in Bloomington, but everywhere he went. He is a great role model for everyone. It's not powered by engines nor steam. as the sails catch on the great winds of hope. Yet full of malice it gave me its worst. but this predicament was not me err. The terrible island seemed to be vast. The winds died down and I soon wouldn't last. Back to the sea I went no matter how bad. Fate eclipsed my destination by force. I fixed it and headed back to the storm. as I grab the rope with blood on my brow. But come now vile sea and give me your worst! We are all on our own journey, following our own dreams. As I reflect back on writing this poem, I not only realize the things I want to aspire to, but the chance many of use were given because of the sacrifice of Thomas Burnett. I have been writing this poem for months, and no amount of words can describe such an act adequately. To say he just gave his life would not sum up his sacrifice. He gave up all his hopes and aspirations, the Christmases with his family, walks in the park, and everything we take for granted. Thomas Burnett certainly had his own dreams, his own wants, yet he gave them up for us, Bloomington, Minnesota, and the whole United States of America. With little doubt he was a selfless man of integrity in this act. To not stand down in the face of terror, and show what Americans do when a community comes together. Thomas Burnett showed the future generations preserve, and to give of yourself instead of just to take. I think extraordinary circumstances do happen to people, but it takes an extraordinary person to choose the right course and the responsible one. It is important to remember he was a real person with real dreams. Thomas showed what the ideal American looks like. Although I did not know him in life, I will not soon forget his and the other people's sacrifice on that plane. Winston Churchill once said "A man does what he must--in spite of personal consequences, in spite of obstacles and dangers and pressures--and that is the basis of all human morality." As I continue my journey I hope I can be at least half the man Thomas Burnett was.